Morning Star Promotes the “Red Gyms” of Merrie Olde England. No St George’s Cross on this banner. Enter a socialist culture from below. 161 are part of a countrywide re-emergence of “red gyms.” One of the most prominent is women-led Solstar Sports Association, based at the Refugee and Workers Cultural Association, a Turkish and Kurdish socialist community centre in Tottenham, North London. Solstar run boxing, martial arts and self-defence classes for adults and kids. It is based on socialist principles and is always run by three experienced female trainers, presently Ella Gilbert, Paula Lamont and Anna Zucchelli: they argue one of the simplest ways to fight sexism is to have women in charge, especially in what are traditionally male-gendered roles. Last month I went to a new gym run by the Cambridge Socialist Club (CSC). The design and socialist aesthetics of the club banner (pictured) might even rival the rightly praised posters produced by Manchester Momentum. Not only is CSC grounded in socialist values, it promotes its links to the trade unions—and if you are a GMB member then you’ll get to train for free. CSC is based at East Barnwell Community Centre and located well away from the world of Cambridge academics and assorted intellectual posers. Like Solstar, the participants come from a range of abilities and backgrounds—including people from Romanian, Lebanese, Portuguese, and Turkish families. GMB rep Gordy Cullum was the inspiration behind starting this new red gym in 2018. After seeing a return of far-right violence on the streets in London last year, he decided to take his gloves back off the hook and start a club for the local community. I sparred with Gordy as he trained for his upcoming fight, when CSC met up with 0161 and Solstar for an interclub boxing card in Manchester. I spoke with Gordy about the role of the St George’s Cross on the club banner—something 0161 have also used unashamedly. Isn’t a national flag and its tainted history something that makes leftists and liberals queasy? Gordy’s response was that the England flag should not be confused with the Union Jack—the flag of British imperialism. What’s more, his take on the flag is that it does not represent the Queen and all the associated pomp and ceremony. Nor is this the England of the far right, no matter how hard they try to hijack the flag as the far right try to hijack national flags everywhere else. Instead, the English flag points to something else that has an obvious popular appeal, and this includes a shared, ongoing and ever-changing history. Underlying his point is something important: if socialism is alien to everyday interests of local communities, who do take the English flag seriously, then how can socialism expect to win? Indeed, is it even socialism if a movement remains dominated by academia and middle-class intellectuals uninterested or even opposed to the English flag? English identity is a ready-made collective identity that can help develop a movement for the many not the few. To succeed, this needs to be a wider cultural socialism that doesn’t just tolerate an English heritage but makes it clear that this is English heritage. Whatever the merits of the red gyms it does not seem appropriate to tack on these claims about “English identity” to the word red. If England has no link to the history of imperialism, then, what is this? “This royal throne of kings, this scepter’d isle, This earth of majesty, this seat of Mars … This blessed plot, this earth, this realm, this England”. The “popular appeal” of the St George’s Flag includes its use by the far-right English Defence League, UKIP, and other National Populists. Saying that any one of these groups “hijacks” the banner is to claim that its rightful owner is somebody else. The flag of the St George Cross, is a royal symbol used because St George was considered a “warrior saint” . A moment’s thought tells you that this, a counterpart to the failed ‘left populist’ attempt by La France insoumise to appropriate the Tricolore, is riddled with problems. Some people are not too fond of Saints, national symbols, nor, for that matter, boxing. Taking the “the English flag seriously” as part of a socialist project…….you’re having a laugh. Unless of course this is a further sign of the pro-Brexit Morning Star’s further descent into the identitarian Blue Labour politics of Family, faith and flag. Blue Labour, Aaron Banks Funded Labour Leave and ‘Trade Unionists’ Against the EU, ‘Marxists’, Plan Rallies on “Transforming Britain after Brexit.”. Blue Labour , Aaron Banks Funded Labour Leave and ‘Trade Unionists Against the EU’, and ‘Marxists’ Launch Speaking Tour. Left Unity has published an excellent article. 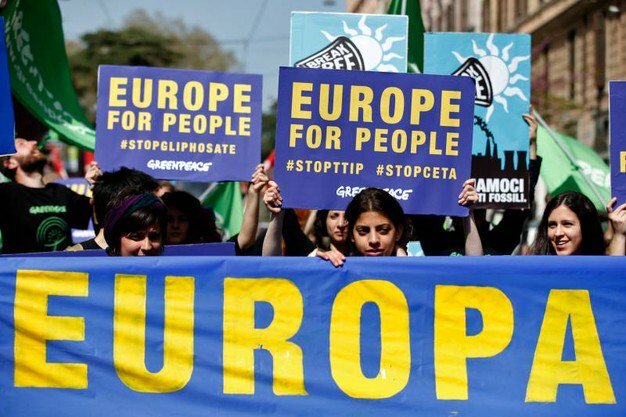 Socialists should still oppose Brexit: Remain and Transform! Craig Lewis and Len Arthur demolish Lexit attempts to dismiss the damaging effects of Brexit on the economy. Trade relations are central to the functioning of an internationally integrated capitalist production process. Socialists cannot afford to dismiss the impact of Brexit on trade. 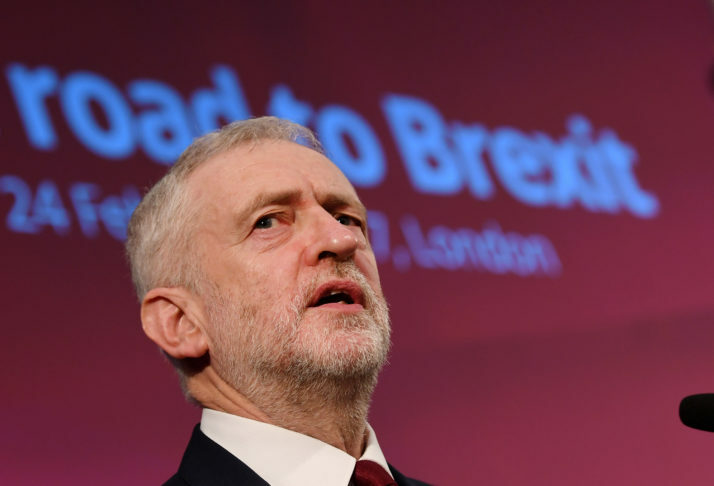 In a widely quoted report for the Renewal journal, Andy Tarrant and Andrea Biondi have undertaken a detailed analysis of claims that EU rules would present significant barriers to Corbyn’s industrial strategy. They looked at each of Labour’s economic proposals in the 2017 manifesto (26 in total). 17 would not fall within State Aid rules at all. 7 potentially do, but these would be exempted under current EU law. Only 2 measures would need to be reported under existing regulations and these could be structured to comply. With regard to nationalisation they suggest that little of Corbyn’s agenda would be affected, and point to the far higher proportion of public ownership in other EU countries. The Remain-supporting radical left must fight alongside those within the Labour Party and wider campaigning groups who seek to commit Jeremy Corbyn’s party to a policy of delaying Brexit to secure a second vote or a General Election. In doing so we should argue boldly for a “Remain and Transform” position. We do not support a “people’s vote” to maintain the status quo in Europe. The EU is as much a terrain of struggle for socialists as the individual capitalist states which comprise it. The radical left in Britain needs to build on the emerging struggles by Europeanising and internationalising the fightback. Internationalism also needs to be an integral part of the socialist case and action in the UK. Defending these politics is what this response is all about and in practice, on the issue of the EU working with others through organisations such as Another Europe is Possible, to ensure that the socialist case for remain and fighting for a social and democratic EU is made as opposed to the ‘business as usual’ case being promoted by others. Just as important is the active defence of working class action across Europe, against the attacks of neoliberal governments such as that of Macron in France; opposing the rise of the right, for example the AfG in Germany; and supporting social and human rights, such as the vote against the anti-abortion laws in Ireland. Here we review and update the socialist case against Lexit outlined in an article on Left Unity’s website last year. The article was a response to a piece by Costas Lapavitsas in Jacobin magazine in May 2018, setting out a case for Labour to pursue a hard Brexit under WTO rules. Since then Lapavitsas has developed his critique of the EU and support for Brexit in his new book (Lapavitsas 2019). He (Lapavitas) will be the key speaker in a series of meetings planned for the run up to Brexit Day on March 29, organised by leading Lexit groups and figures including the Communist Party of Britain, Counterfire, Tariq Ali, the Guardian’s Larry Elliot and, bizarrely, Baron Glasman of Blue Labour: Transforming Britain after Brexit. Indeed but the gathering is worse, a lot worse, than just the individual appearance of Glasman. The tour is launched by the Full Brexit. Transforming Britain After Brexit kicks off: Coventry 4 March! Worrying that an official of the FBU is willing to promote people who take money from right wing anti-union US billionaires. (Koch Brothers). Corbyn is an imbecile amongst imbeciles. One flew over the cuckoos nest of spineless amateurs with pathetic rhetoric. Worse than useless. Lexit and Brexit collaboration-what did the Morning Star know? Arron Banks is currently under investigation by the Electoral Commission for funding of Trade Unionists Against the EU (£54,000) and other organisations. Some more background to this can be found here and here. A few days ago this came out, making the claim about Labour Leave’s funding by Aaron Banks. Labour Leave did not declare any donations from Leave.EU or the Banks organisation. The emails suggest that at least three prominent members of Labour Leave were also paid by Banks’s organisation. They include the former Labour MP and trade minister Nigel Griffiths, Brendan Chilton, the General Secretary of Labour Leave. and the Head of Communications, Olly Huitson. Mr Huitson and Mr Griffiths told Channel 4 News they had expected the payments to be declared by the relevant organisation. Mr Huitson said he worked for Labour Leave only and understood that his costs would be treated as a non-cash donation from the Banks organisation. They were not declared. In an interview, John Mills, the Labour donor who ran Labour Leave, admitted he had failed to properly declare the office costs to the Electoral Commission. But he insisted Labour Leave was an independent organisation, and not controlled or directed in any way by Arron Banks or Leave.EU. So we have a series of meetings bringing together Counterfire, New Left Review, The Morning Star, Arthur Scargill, the Communist Party of Britain, magic money soveriegntists, Benittes in their second youth, Blue Labour, anti-multiculturalists, raving patriots, and Labour Leave, who are embroilled in a scandal about extensive far-right funding, not to mention the other recipients of Banks’ money, Trade Unionists Against the EU. Channel 4 News can reveal that Labour Leave is under investigation by the Electoral Commission. Corbyn Goes Pro-Brexit with “Re-Negotiation” plan. Corbyn on Rocky Brexit Road. “You’d have to go back and negotiate, and see what the timetable would be,” the 69-year-old told the Guardian newspaper, when asked what he would do if he won an early election designed to break the deadlock in parliament. Labour wants a permanent customs union with the EU and a close relationship with its lucrative single market. The policy has been dubbed “constructive ambiguity” by some, who question whether Labour could negotiate a better deal. Some of these people are close the Leader of the Opposition. They appear to be making Labour strategy, on their interpretation of party policy, off the hoof. Britain can, alone, be a socialist “Beacon” a shining “radical break with neoliberalism ” in a benighted world. Perhaps from its heights Corbyn can tear up lengthy re-negotiations, begin again, and get a customs union, and who knows what other benefits? He may find time to cast off the economy’s moorings from the capitalist world, WTO rules, and the IMF. In fact the EU and its negotiators have made it clear that another negotiation is not on the cards at the moment. We shall see if another one, for a Beacon Brexit, is possible. It goes without saying that many do not agree with this strategy. How far is Corbyn willing to share the opinions of the sovereigntist hard-liners is a matter for him. For the Party it is of great concern. Faced with this turn this call in the excellent Clarion, by Manuel Cortes, looks all the more important. Transport Salaried Staffs’ Association General Secretary Manuel Cortes, a prominent supporter of Jeremy Corbyn and opponent of Brexit, spoke to The Clarion. You’ve called for a special Labour conference to decide the party’s Brexit policy. Why? I think it’s very clear that if we’re going to push for a referendum, the party needs to make a decision about about what it’s going to argue in that vote. At the same time, Brexit is evolving on a day to day basis – we need an opportunity to take stock about what we’ll argue in a referendum but also how we’ll campaign to get one. Andrew Gwynne has alluded to the members deciding our position in a referendum – and the only way to do that is to call a special conference. Is it realistic? Well, it’s been done before. In 1975, Labour called a special conference at short notice when the referendum on remaining in the European Community was announced. And what position would you advocate at the conference? My position remains that we should remain in the EU and work together with socialists and labour movements across the continent to create a Europe for the many. Jeremy Corbyn campaigned for this in 2016, he was right then and it’s the right position now. Clearly the kind of Europe we want to create is one that favours working people – that puts people first. We need an end to austerity and to a system which does extremely well for the one percent at the expense of the other ninety nine. If we’re going to slay the neoliberal dragon and take on global capitalism we have a much better chance in a union of 28 nations than by ourselves. The situation in the Labour Party seems complicated and hard to predict. How do you think it will play out? We’ve got a political and constitutional crisis in our country. We’ve had paralysis for the last 30 months at Westminster, ever since the referendum result. I think Labour has not done that badly in the sense that it’s attempted to heal a very divided country. However, it’s become increasingly clear that the party membership and the great majority of our voters no longer want us to leave the EU. In a democratic party we have to recognise and respect that. The best way to solve this contradiction is a popular vote and for Labour to make a strong case for Jeremy’s vision. What would you say to those who say a second referendum will disillusion blue-collar working-class voters even more and drive them away from Labour? I′m not arguing we should remain in Europe with the status quo. Far from it. We need a Labour government committed to the kind of policies we had in the 2017 manifesto. It’s been far too easy for British politicians to blame the problems that afflict so many of our citizens on Europe, when by and large they are the fault of Westminster – the privatisation and deregulation of our economy, the fact that we have the most stringent anti-union laws in Western Europe, the lack of labour rights compared to many European countries, all these problems stem from Westminster not Brussels. I’m extremely proud that working people in 32 countries have the right to move freely. We want that right to be extended, but to give up the right we have is nonsense. I’m a union leader. I’m not in the business of giving the rights our workers currently enjoy. It’s not migrants who create low wages and insecurity, it’s unscrupulous bosses. The Labour Party must work with our allies across Europe, in terms of democracy but also an economic program that makes the lives of working people far better. For instance we need to extend collective bargaining and ensure there’s a union in every workplace so that workers can fight for their rights. We need repeal of all the anti-union laws, and their replacement with a charter of positive rights for workers. We need to regulate our economy, ban zero hours contracts and introduce a real living wage of at least £10 an hour. We need to ensure resources are made available to enforce all those things. Then it won’t matter if you come from Wigan or Brussels, everyone will be treated the same in the workplace. That argument about free movement, aren’t there a lot of people in the Labour Party, including on the left, reluctant to take that on? The majority of our members want to say and the majority of our voters want to stay. They know that you can’t stay in the EU without freedom of movement. You don’t have to win that argument with most of our members and voters. There is a minority of people we have to challenge and win over but let’s not inflate their voices. It often seems there is widespread reluctance to criticise Corbyn. What do you think? I think one thing Corbyn will respect, because he has been known as a rebel for most of his political life, is this – if you think something is right you should articulate your point and do so forcefully. I’m standing up for what I believe. The people of our country will be far worse off if we leave the EU. The xenophobia that’s been unleashed is a terrible poison and we can’t give victory to the people who unleashed it – Farage, Johnson, Rees-Mogg. If there is a second referendum, it seems likely the dominant Remain campaign will be a bourgeois lash up similar to the first one but with a slightly more activisty buzz. In that situation, what should the anti-Brexit left do? Actually I think we’re in a very different place from 2016, because Corbyn has now consolidated his leadership of the Labour Party. The party machine and our half a million members should be mobilised and we should have our own agenda – a firm commitment to remain and to fight to change Europe. We should not get involved in so called cross party alliances. In the last referendum I campaigned with Another Europe is Possible, and I am all for Labour members organising for this perspective, but my view now that Jeremy has consolidated his leadership is that the Labour Party itself should run a high profile campaign. But what if it doesn’t adopt that position? My confidence is rooted in the fact that the overwhelming majority of Labour members want this. No party can survive long term without giving its members the ability to influence its policies. More importantly still, perhaps, Jeremy and John have a strong record of seeking to involve ordinary members in decision-making. That’s why I’m calling for a special conference. I think if things are moving towards a public vote a conference will happen and I can only see it taking one position – remain and reform. 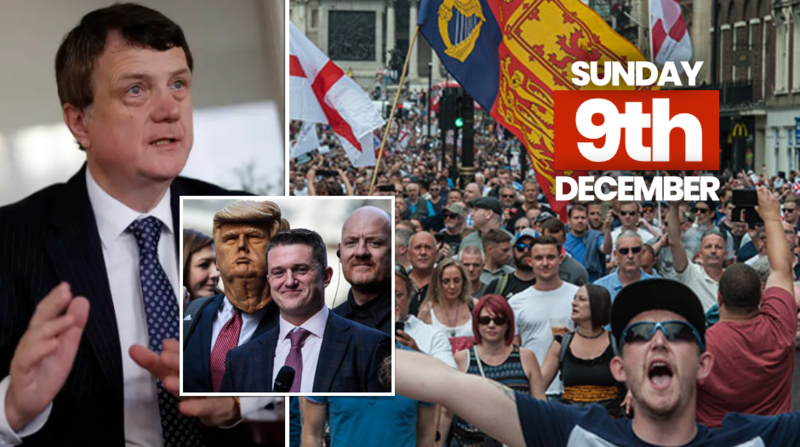 Socialist Worker and Novara Media Attack Anti-Fascist Anti-Brexit Demo Against Tommy Robinson Great Brexit Betrayal Rally. Pro-Brexit Rally Calls for Anti-Brexit Response. The Another Europe is Possible protest “No to Tommy Robinson, No to Brexit” continues to create controversy. After having carefully established that AEIP is “ultra”, AWL backed, no less, and, apparently has a view (which is not referenced) on the Brexit basis of the “far right project in its entirety” they outline an alternative. Cant and Walters argument appears to be that the left needs to talk to Brexit supporters, to weed them away from Robinson and UKIP leadership. Yes, we “all hate Tommy”. But, one might ask how, as they suggest, is the left going to lead Leave voters? By arguing for a People’s Brexit? By saying that a Brexit Britain with a “socialist economy” will be (as a Counterfire contributor put it recently) a “Beacon” off the shores of Europe? Brexit is not a “floating signifier” that you can moor to the left’s politics. It is a reactionary project through and through. …..anti-fascist fronts should only express the limited politics necessary to defeat the fascists on the day. They should appeal to as many people as possible (regardless of what they think about Brexit). They should recognise that the goal of the front is only to prevent the fascists from taking leadership. It is against Europe, that’s for sure. The Another Europe Is Possible campaign has called a separate mobilisation under the dangerous slogan of “No to Tommy Robinson—no to Brexit”. The organisers link opposition to Robinson to demands for a “People’s Vote” to stop Brexit. Racism against migrants pushed by both Tory Brexiteers and Labour ­“centrists” who want to block Brexit has added to the racist atmosphere. So the ‘limited’ united front is also against “Labour ‘centrists'”. The SWP view on “anti-fascists” who “send volunteers to the Middle East to fight Isis” is not known. Patriotism and Nationalism, from Orwell to Trump Mocking France’s War Dead. People have debated these lines and the article for many years. But Trump has just clarified the meaning of these sentences. First thing in the U.S. morning, the U.S. president took another — even more pointed — crack at the French leader. After a fractious visit to Paris over the weekend, Trump returned to the theme of a European army to defend the continent’s interests and took renewed offence. In a particularly sharp jab, Trump implied that the French needed the U.S. to rescue them from the Germans in both world wars. The tweet comes after Trump spent a weekend in Paris with other world leaders commemorating the 100th anniversary of the end of World War 1. In an earlier tweet, the American president had called Macron’s suggestion “very insulting.” Trump’s latest broad-side was ill-timed, falling on the third anniversary of Paris terror attacks that killed more than 130 people and left hundreds more injured. “Patriotism is the exact opposite of nationalism,” Macron said in an address to world leaders gathered for Armistice commemorations, with Trump sitting nearby. L’Elysée se refuse pour l’heure à tout commentaire après cette série de tweets, indique l’AFP. 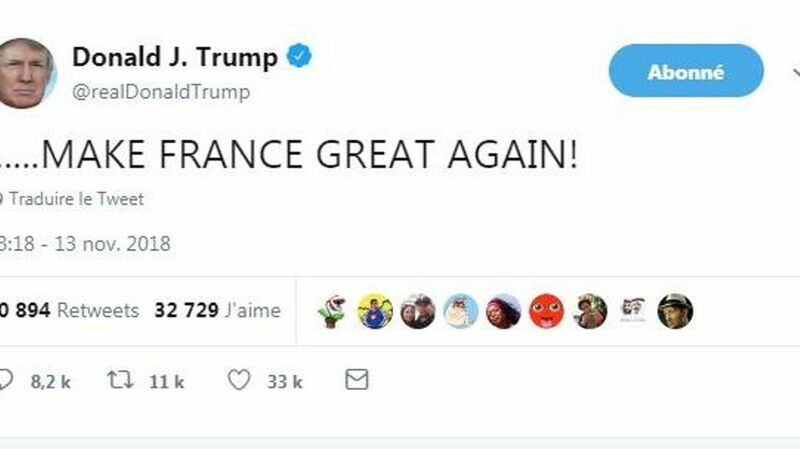 However much one may normally disagree with Marcon, we are in in solidarity with the French President against this draft-dodging flatulent flaccid fraud US President.